The Oregon Historical Society’s Holiday Cheer is just around the corner on December 6th. 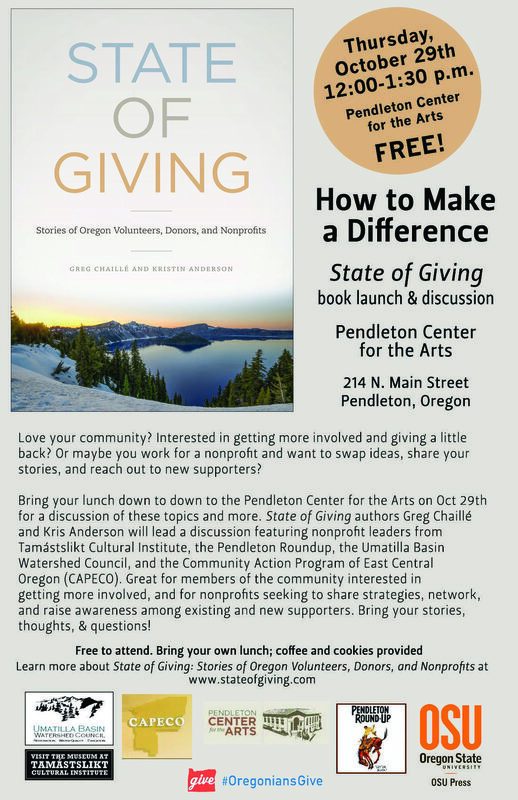 Come check out great new works published in Oregon this year, enjoy carolers and hot chocolate, chat to Greg and Kris, and pick up a few copies of State of Giving — the perfect gift for the givers in your family! Free admission! The Oregon Historical Society is located in downtown Portland at 1200 SW Park Avenue. 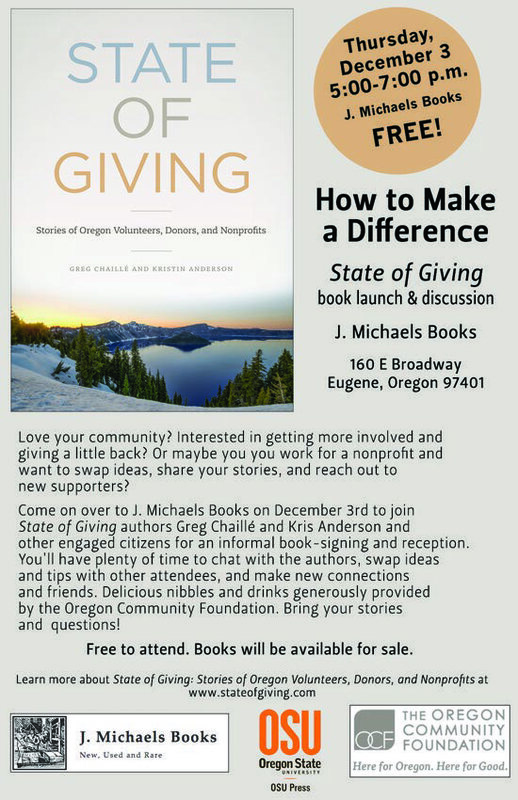 Join us in Eugene on December 3rd. 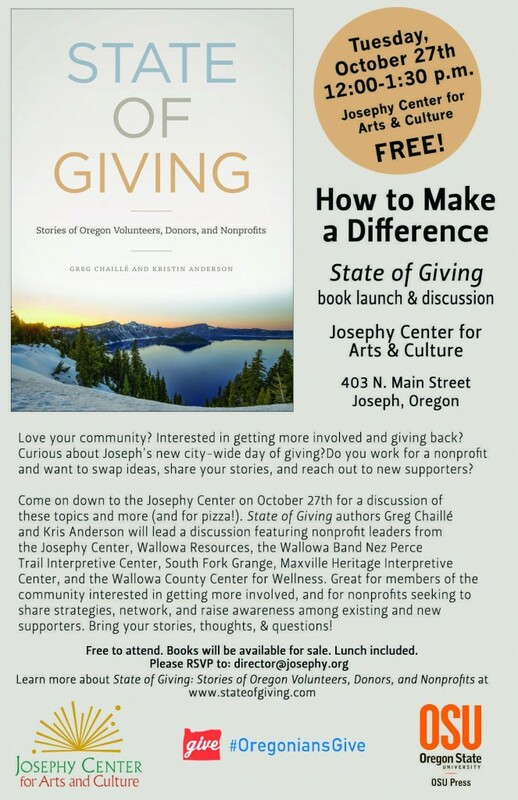 Come visit with Greg and Kris at J. Michaels bookstore for a public State of Giving reception and book-signing! 5pm – 7pm. Nibbles and drinks provided! Join us at Baker County Public Library (2400 Resort St., Baker City) on October 28th from 7:00 – 8:00 p.m. for an author talk and public discussion showcasing local leaders and organizations. Salem: Join us in Salem at the Kroc Center, in partnership with the Statesman Journal, in late fall. Details forthcoming. Join co-author Kris Anderson in Portland on October 2nd, 11:30-1:00pm, at the Association of Fundraising Professional’s “Women in Philanthropy Today” luncheon, where she will be a panelist. Join us in Bend on June 22nd at Deschutes Public Library (downtown Bend branch) from 12-1:30. Bring your lunch, learn about State of Giving‘s findings, and hear about how nonprofits, and people like you, are making a difference in Central Oregon. Featuring a panel discussion including Bradley Porterfield, Director of the Latino Community Association of Bend and Dan Morse, Conservation Director of the Oregon Natural Desert Association. JOIN US on JUNE 16th for our first public PORTLAND event! Interested in getting more involved with your community? Do you work for, volunteer with, or donate to a nonprofit? Or do you want to know more about what they do, and how you can make a difference? 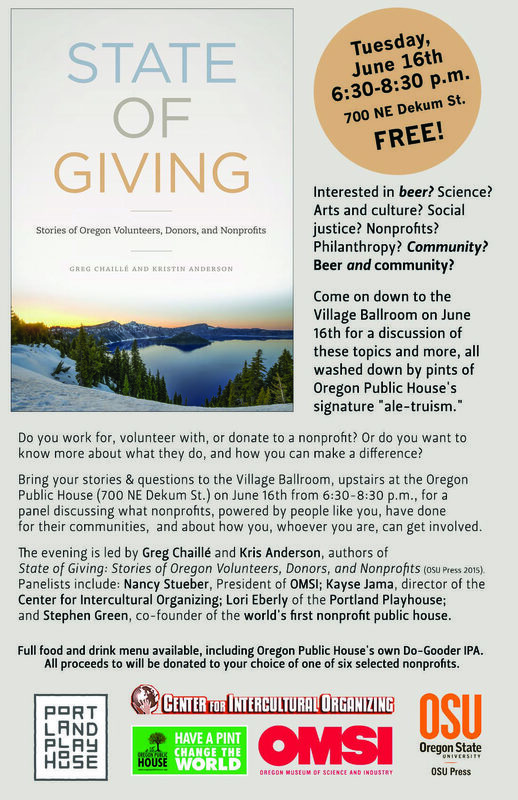 Bring your stories & questions to the Oregon Public House (700 NE Dekum St.) on June 16th from 6:30-8:30 for a community panel discussing what nonprofits, powered by people like you, have done for their communities, and about how you, whoever you are, can get involved. 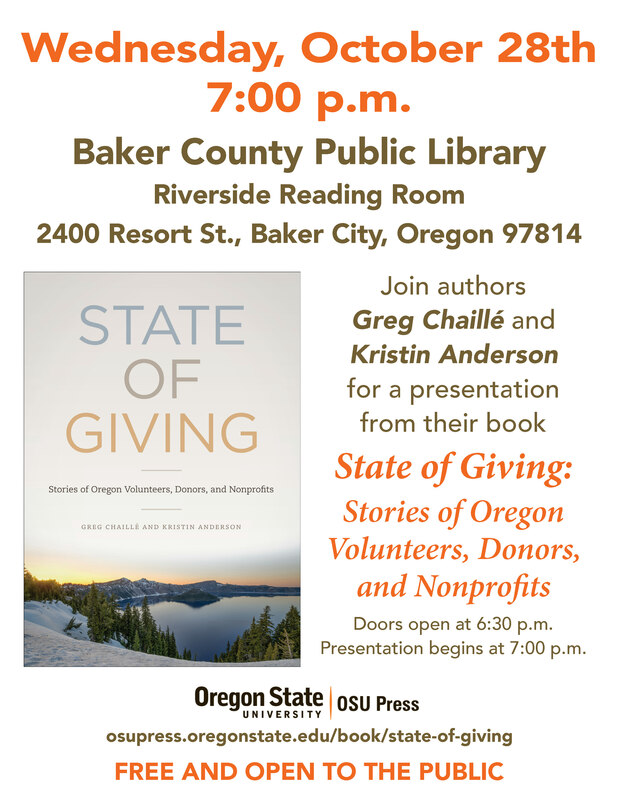 The evening celebrates the launch of State of Giving: Stories of Oregon Volunteers, Donors, and Nonprofits(OSU Press 2015). Authors Greg Chaillé and Kris Anderson will lead a panel discussion featuring Nancy Stueber, President of OMSI; Kayse Jama, director of the Center for Intercultural Organizing; and Ryan Saari, director of the world’s first nonprofit public house. Full food and drink menu available, including Oregon Public House’s own Do-Gooder IPA. All proceeds to will be donated to your choice of one of six selected nonprofits. See Roseburg event photos here! Join us in Roseburg on May 26th, 11:30-1pm, for The Ford Family Foundation’s Back Fence Speaker Series. We’ll be talking about the book’s findings and answering your questions. It’s a free event, with lunch provided. Register here. Join us in Eugene on May 13th, Hendricks Hall Hearth at the University of Oregon, 5:30 pm for a panel discussion featuring local nonprofit leaders, hosted by Professor Renee Irvin. Our panelists include Riley Grannan, Managing Director of Eugene Ballet; Julie Daniel of BRING Recycling; and Heidi Khokhar of the Rural Development Initiative. See Medford launch photos here! Jim Walls of Lake County Resource Initiative. 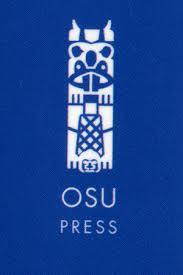 OUR OFFICIAL LAUNCH AT THE OREGON HISTORICAL SOCIETY, APRIL 15th! 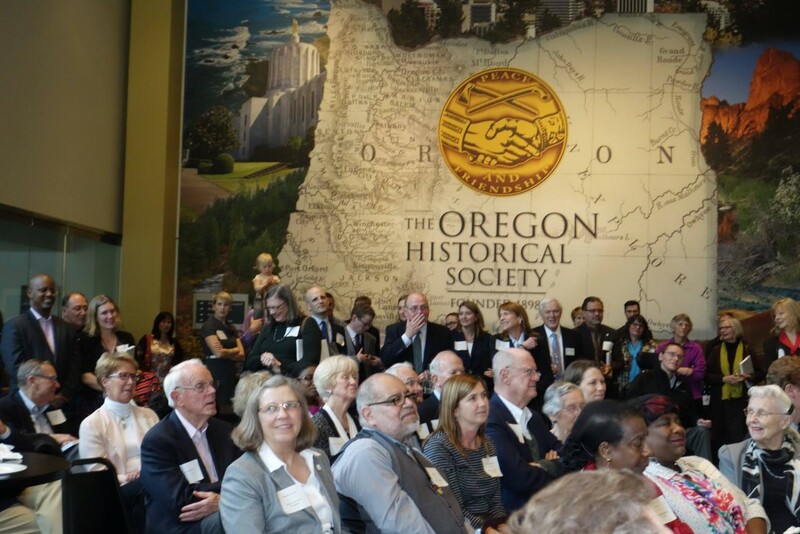 Thanks to all those who came and celebrated with us, and to Oregon State University Press, the Oregon Historical Society, and the Oregon Community Foundation for co-hosting! 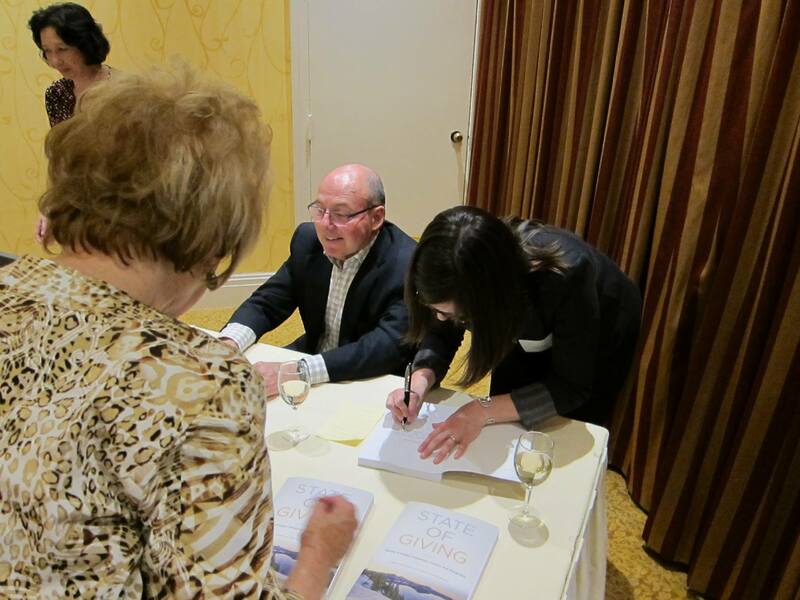 We had so many wonderful, admirable people there from across Oregon’s philanthropic and nonprofit communities. 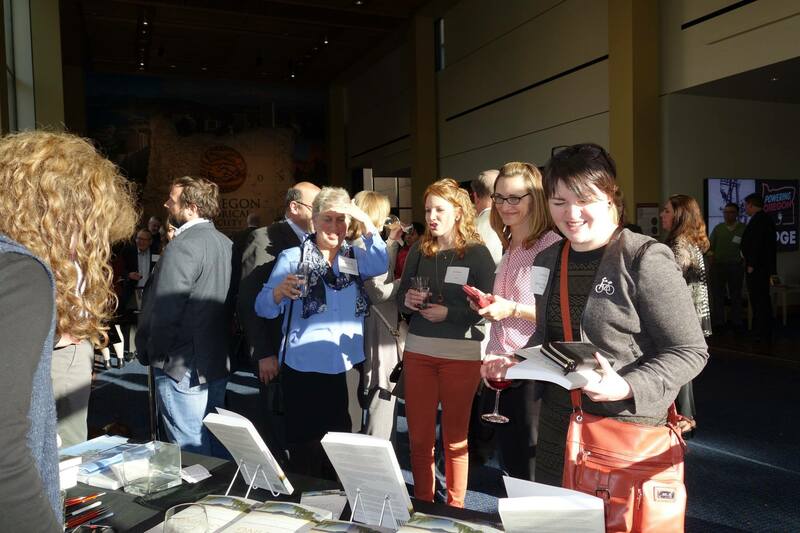 Almost 200 attendees, all of whom helped us celebrate the good work being done in Oregon, and those who do it! And thanks to our many friends who have hosted private events in Bandon, Medford, Bend, Portland, and elsewhere!